The Diachieve® brand was created to give people with diabetes affordable options while maintaining the highest quality and safety. Diachieve products are created under the guidance of an industry-leading professional health advisory board and backed by a money-back guarantee. 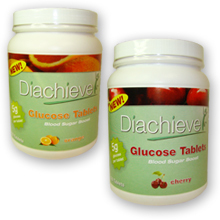 Diachieve diabetes products provide superior value to make managing diabetes more affordable. By making products that are affordably priced, people with diabetes can follow a healthy diabetes management routine. Our goal with Diachieve is to bring quality, dependable diabetes solutions while seeking more innovative and affordable approaches to diabetes management.